The tours on this page fully comply with the norms of Islam. 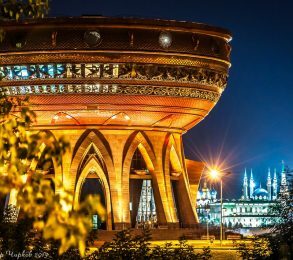 Only certified places are included in Halal tours to Kazan. Guests will be greeted by trained personnel familiar with all the rules and nuances of their religious culture. Food will be made exclusively from halal products and in compliance with all requirements. All infrastructure contains separate zones for men and women. The service is fully adapted to the norms of Sharia. Halal tours allow Muslims to relax with maximum comfort in the best hotels, freely using all the advantages of the service. There are prayer rooms for guests, carpets for namaz. 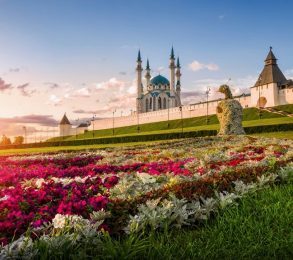 Halal rest in the capital of Tatarstan will allow guests to explore the city and local shrines in accordance with native customs. Excursions accompanied by a sensitive guide allow to see the Old Tatar settlement, immerse into the past of merchant life, to pay homage to the magnificent mosques. Rest after walking excursions is accompanied by a specialized service. Guests will be able to comfortably visit the pool and spa treatments, where everything is organized according to the peculiarities of their culture and customs. Taste the traditional cuisine, cooked in strict accordance with the norms of Sharia. Kazan warmly shares the atmosphere of friendly and tolerant neighborhood of different cultures, creating a cozy space for exploring the Tatar traditions and ancient craft. Numerous museums open their doors to all comers. Master classes on embroidery, Old Russian calligraphy, cooking and other arts are held here. Particular attention should be paid to the evening streets tour. The places of interest with elaborate illumination against the background of the night sky, among the shining lights of the street lamps of the avenues fascinate the eyes. The city is saturated with the scents of fairy tales and magic. It is convenient to organize a trip from Kazan to the Bulgar. It’s a city where annually celebrations in honor of the adoption of Islam are held. The territory is full of historical and architectural monuments, mosques and cathedrals. Here you can admire the buildings of a small city that have been preserved from the XIV century. The memorial sign of the Sahabam worth visiting. It is located near the tower of the Small Minaret, where, according to legend, Mohammed’s associate rests. The legendary well of Gabdrachman, which according to legend, was opened from the prophet follower stick blow, looks fresh. Ancient stone buildings, mausoleums and chambers, modern buildings erected in memory of past events and the White Mosque, among other attractions, are waiting in the reserve museum. There is a museum of the Koran in Bulgar. It tells about the development of Islam in the region. It is worth making time to visit the Temple of All Religions, where architectural traditions of various beliefs are combined in a single ensemble. Exhibits dedicated to 16 different religions, including the disappeared cults, are kept under the different-style domes. Within the walls of the architectural masterpiece there is an exhibition of painting and decorative art. Respect for theatrical culture and tea ceremonies is given by the halls reserved for this purpose.